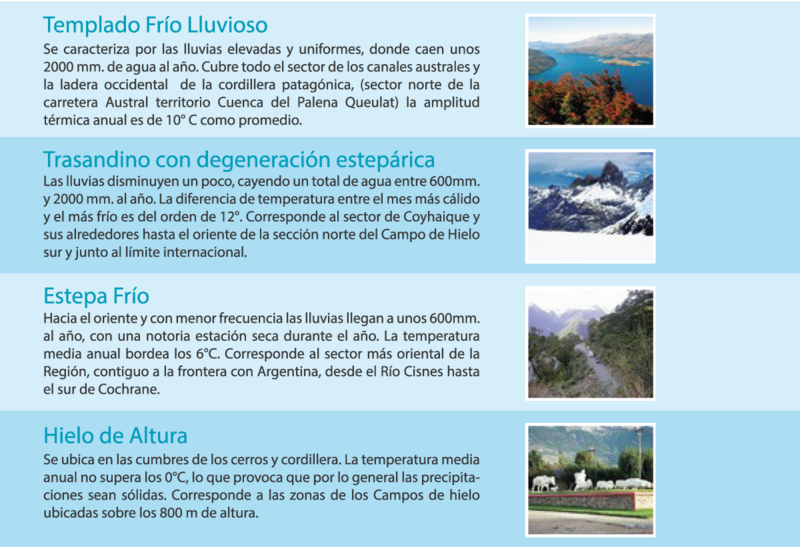 In the southernmost of Chile, over an abrupt, irregular and heterogeneous terrain, it is located the Aysen Region. Zone formed by a continental territory which is crossed by the Andean Mountains and several islands in the Pacific Ocean. It has a rich diversity of landscapes and reliefs along and across the territory. The region has a surface of more than 100 thousand km2, which represents almost the 15% of the surface of continental and insular Chile. It is the third biggest region, divided into four provinces and ten communes. Its capital is Coyhaique, city located between the confluence of Coyhaique and Simpson rivers. Archipelagic Areas: a prolongation of the Coastal Mountain Range, where you will find the famous channels and fjords of the region, among where the islands of Aysen and Taitao Peninsula are located. Central Depression: it is to the east of Taitao Peninsula, ending its presence in the Isthmus of Ofqui until disappearing into the sea of Gulf of Penas. Andean Mountains: represents the most important area and the biggest of Aysen, it is present in the insular as well as in the continental territory. It is compound by an abrupt terrain of big uneven pieces of land, a few plains and a lot of surfaces covered by ice. Eastern Sub-Andean Range: A series of mountain ranges, mainly made of volcanic rock, mixing with the valleys making a transition area. Eastern Planiform Reliefs: in the border zone of the region, here are located important villages such as Balmaceda, the town where the planes arrived at the Aysen Region from Santiago, Puerto Montt, and Punta Arenas. 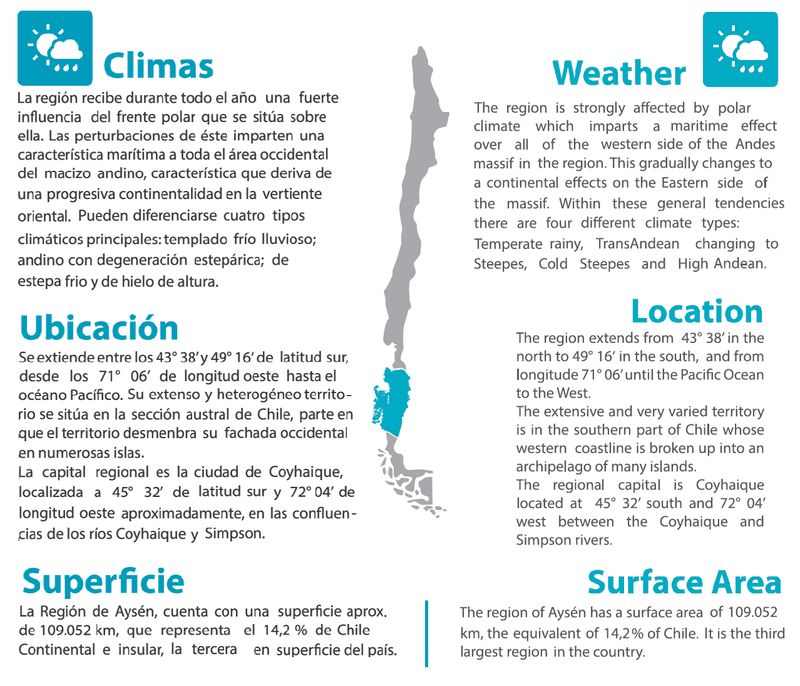 The complexity of its terrain explains in part why Aysen is one of the most recently inhabited regions of the country. The settlement occurred recently in the end of the XIX century when the most of Chile was already populated and it was mostly concentrated in the basin of Aysen river and the confluence of Coyhaique and Simpson river, where the regional capital is nowadays. Most of the immigrant settlers came from diverse places located in the east of the region and they established throughout the territory in places with fertile lands suitable for the agricultural activity development. For that reason, most of part of the current population is concentrated in the basin of Aysen river, a place located between the eastern sub-Andean basins and the pampa. Essentially in urban areas, in the cities of Coyhaique and Puerto Aysen, which are just 67 km away from each other. On the other hand, the dismembered coastline of Aysen is nearly deserted. Just standing out the small islander towns like Puerto Aguirre and Melinka.